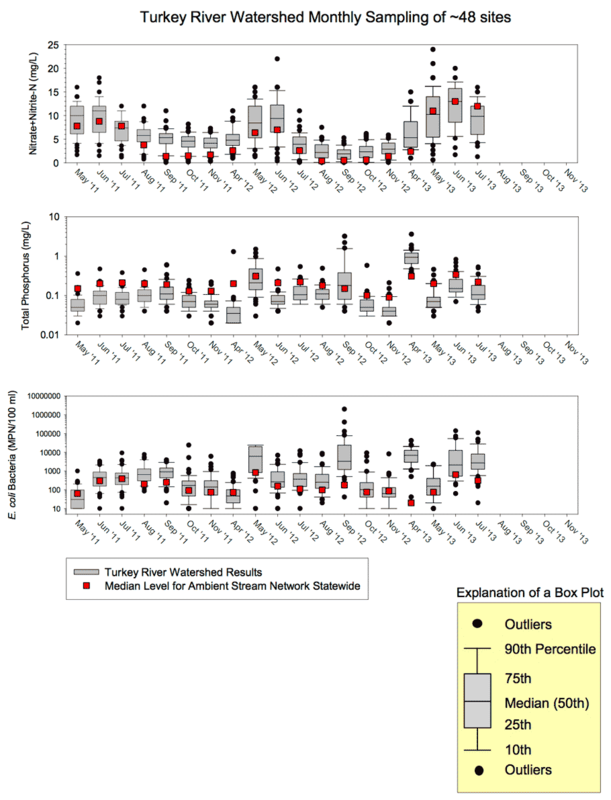 Beginning in May 2011, participants in the Turkey River Watershed Alliance and IOWATER volunteer water quality sampling program have sampled water quality at 49 sites across the 1 million acre Turkey River watershed. On one day of each month, from April through November, volunteers sample water quality at several locations along the main branch of the Turkey River, and at locations along 35+ tributaries. All samples are collected during a 7-9 hour span, and water samples are sent to the State Hygienic Lab for analysis. The lab analyzes the water for concentrations of Ammonia Nitrogen as N, E. Coli Bacteria, Nitrate + Nitrite Nitrogen as N, and Total Phosphate as P, while field measurements include water temperature, pH, Dissolved Oxygen, Transparency, and Chloride. This data can then be used by landowners, citizens, communities, and resource professionals to better understand the problems in the watershed, find cost-effective ways to to solve water-related problems, and make financial and technical assistance available to public and private landowners when needed. Crane Creek @ 120th St.
Little Turkey River @ 120th St.
Silver Creek @ 172nd St.
Turkey River @ 345th St.
Dry Branch @ 110th St.